The Back-Roller Classic rear panniers are made of PD620 and PS490 and feature a waterproof roll closure and QL2.1 mounting system. Once taken off the rack, the padded strap allows a comfortable shoulder carrying. Strong 3M Scotchlite reflectors ensure safety in the dark and in bad weather conditions. With the ORTLIEB Travel-Biker or Trunk-Bag they also form a functional combination on the rear bike rack. This can be converted to a backpack with optional Ortlieb Backpack Harness. a little weighty. Also had the bottom fastening screw piece fall out, Not sure if I can get a new one but it's definitely a bummer. Excellent product, speed, and service! 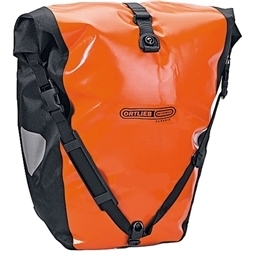 These are, undoubtedly, the best panniers available. Not pricey when you consider the value of my MacPro, and other valuables that I can't risk getting wet. Everything is kept bone-dry inside. I use empty MacPro boxes to carry my shirt and pants to keep them wrinkle-free. Because these are so easy to remove (just lift the handle-strap), it's easy to get changed. These panniers make the trip pleasurable, and the bright orange color (not fluro) gives me an additional sense of security when I'm on busy streets. These are the only panniers I would recommend. HIGHLY RECOMMENDED. Absolutely None. This is a great product and functions beautifully. Modern bike did a great job of getting my panniers to me quickly, so I could start using them during National Bike Month. Thanks, guys!